Winter can be a troublesome season when the outdoors gets neglected. Here at Australian Outdoor Living we have come up with a few options to help you spend more time outside. With all the rain we’ve been having around the country, it’s no surprise that we want to stay indoors with the heat under a blanket. Winter doesn’t always have to be like this so we’ve come up with some simple ideas to help you make the most of the wet weather. One of these gems should be top of the shopping list when you’re out and about hunting for ideas to withstand the cold weather. While Australian Outdoor Living doesn’t sell these, we think they’re a great addition to all outdoor areas. Nowadays there are many styles to choose from including the classic patio heater as we know it and a few more contemporary designs like the ones pictured below. So you’ve got a little area outside the sliding doors out the back but there’s not really too much from for more than a few people, right? Just tacking on a few more square metres of an undercover entertaining area can make the world of difference to not only your lifestyle but also the value of your home. Australian Outdoor Living can help. We have an excellent team of craftsmen ready to design your outdoor area under which you can put your new patio heater. 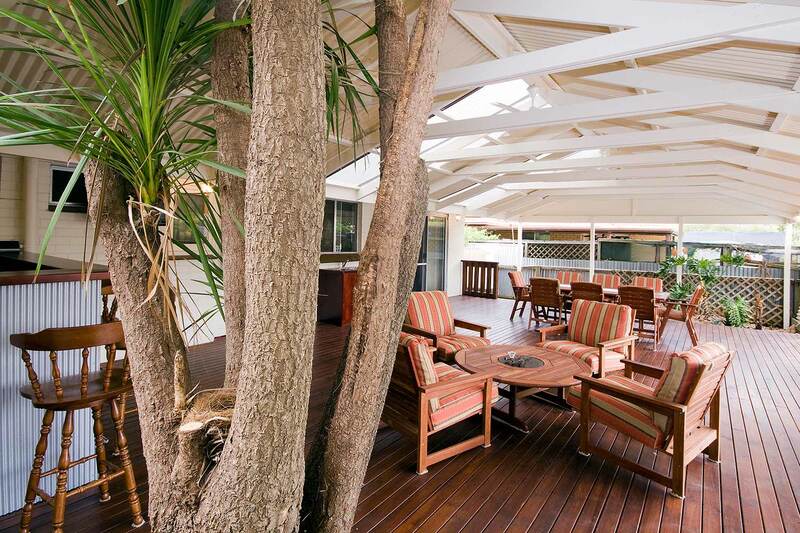 Australian Outdoor Living can create a patio to suit your space! 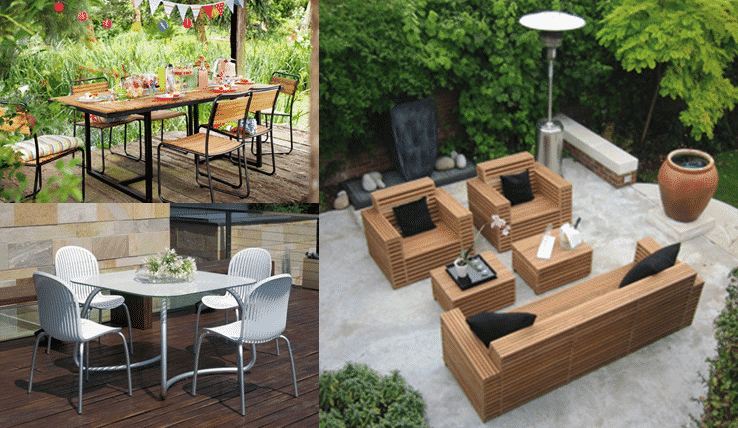 Finding the right furniture for your outdoor setting is often as difficult as picking your indoor furniture, which, let’s face it, is used a lot more than your outdoor setting. A lot of the time, you can incorporate a couple of combinations: the coffee table and seating arrangement as well as the dining table for when you have a big knees up with a few friends. Choosing these options makes your outdoor area more versatile for a variety of activities. We can already picture you and your friends kicking back near the patio heater with a couple of drinks and some nice food on a Saturday night. Outdoor furniture will look great with your Australian Outdoor Living verandah or patio! We all know that with rain, often comes wind and with the addition of your new patio heater, you need to keep the heat in and the cold out. That’s why Australian Outdoor Living’s outdoor blinds have come to the rescue. Not only are they extremely resilient to wind and rain but they don’t spoil the view. Our Shade Blinds have tiny breathable holes which allow for airflow but still minimise the blustery winds. If you prefer a cleaner look, consider Australian Outdoor Living’s Clear/Tinted Blinds that give a seamless transition from outdoors to indoors. Both have amazing benefits and add style to your outdoor setting without completely blocking the positives of an outdoor lifestyle. Australian Outdoor Living’s artificial grass is the final option that will make your life so much easier all year around. As mentioned before, the amount of rain around the country has been incredible and while it’s good for our Aussie farmers, it’s not so great for those of us who will have to mow the lawn the next time it’s dry. Artificial grass will not grow – there’s no two ways about it! You can sit back and relax in the knowledge that you can finally get rid of the mower. In Summer, you’ll have a well covered, prickle-free area for all the family to enjoy in the sunshine and the best part is it has UV protection so won’t fade during our intense Summer months. We hope these handy tips will provide you with a little light in these gloomy Winter months.